This "tweener" has a lot going for it. 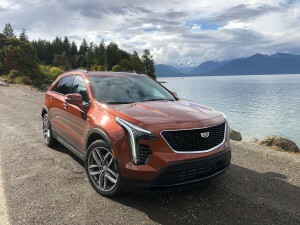 The 2019 Cadillac XT4 gets is own platform as well as unique 2.0-liter turbo engine and 9-speed auto. Its been more than a decade since Cadillac introduced its CTS sedan and Art & Science design language, setting into motion what was supposed to be the revival of a brand long known as “the standard of the world.” Things haven’t gone quite as expected, however. On the plus side, Caddy is expecting to rack up record sales this year, largely the result of the booming Chinese market. But, back home, the turnaround has been dragging, in large part because the brand has been significantly out of sync with the market. Even as it rolled out a procession of new sedans and coupes, American buyers by the millions have migrated to SUVs and CUVs. That’s been all the more apparent in the luxury segment where BMW, for one, has filled in practically every gap with crossovers ranging from the X1 to X7, and even more to follow. Caddy has been struggling to shift directions. It’s largely gotten out of the coupe market and will soon drop the compact ATS, consolidating its sedan family. More importantly, it is finally beginning to flesh out its crossover line-up with the launch of the new 2019 Cadillac XT4. The compact CUV joins the bigger XT5 model introduced in 2016, as well as the Caddy’s utility vehicle flagship, the full-size Escalade. 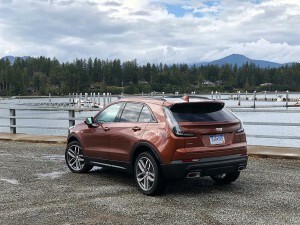 Unveiled at the New York Auto Show last March, and set to reach showrooms this coming autumn, the XT4 could become one of the most important products the brand has introduced in decades, finally putting it in the game alongside such key competitors as the Audi Q3, the BMW X3 and the Mercedes-Benz GLC, among others, in what has become one of the world’s fastest-growing market segments. Cadillac is looking to make up for lost time in the small crossover arena with the new XT4. The Caddy XT4 is a handsome vehicle, more distinctive than the XT5 which adopted a somewhat derivative look. It boasts a coupe-like silhouette that manages to avoid sacrificing rear headroom, for one thing. There’s a youthful athleticism to what is, on the whole, a more curvaceous take on the original Art & Science design language, with less of the radical angles and edges first seen on the gen-1 CTS sedan. But key design cues carry over, including the brand’s trademark vertical LED head and taillights. They frame a version of the flagship CT6 sedan’s grille. The original plan called for the XT4 to share the same architecture as the earlier XT5. The automaker decided to rethink that strategy, explained Chief Engineer Todd Pawlik, opting to give the compact model its own platform, one that wouldn’t make unnecessary sacrifices in terms of design and layout. It rides lower than its sibling, for one thing. And a closer look at its exterior dimensions – a wheelbase of 109.4 inches, total length of 181.1, width of 74.1 and height of 64.1 inches — reveals that, much like the original CTS sedan, the Cadillac XT4 is a tweener. It really slots in-between the BMW X1 and X3 and the Mercedes GLA and GLC models. For passengers, a well-executed interior layout translates into compact head, shoulder and legroom though, at 48.9 cubic feet, you do sacrifice a bit of cargo space. The new Cadillac XT4 is the first of many new utility vehicles the brand expects to introduce in the next two years. Moving forward, Cadillac is adopting what it described as a “Y” strategy. There’s a base model, of course, in this case the XT Luxury edition that starts at $35,790, including a $995 delivery charge. Off to the upper left you’ll see premium editions that load up the luxury gear. At the other extreme, there’s the XT4 Sport and, we’re betting, we’ll eventually see a V-Sport edition that kicks performance up a notch. For now, however, all versions share the same twin-scroll turbocharged 2.0-liter gas engine making 237 horsepower and 258 pound-feet of torque, feeding that through a nine-speed automatic gearbox. Caddy also bills that inline-four as “all-new,” and it features some intriguing technical tricks to both boost performance while also maximizing mileage. That includes the Tripower valvetrain system which allows allows or three distinct settings on the cam lobe. Add Active Fuel Management which allows the engine control system to disable two of the cylinders when power demand is light. The combination means fuel economy of 22 to 24 mpg City – depending on whether you’ve got the front- or all-wheel-drive model, and highway numbers of 29 pr 30 mpg. We spent a good portion of our first drive in the XT4 Sport model equipped with optional all-wheel-drive. The system uses a combination of brake intervention up front and twin clutches on the rear axle to vector torque for improved handling. The Sport edition features driver-adjustable modes that impact a variety of vehicle functions, including its continuously variable damping system, as well as throttle response, shifts and steering feel. The new XT4 offers plenty of interior space despite its small exterior, helping it keep pace with competitors. 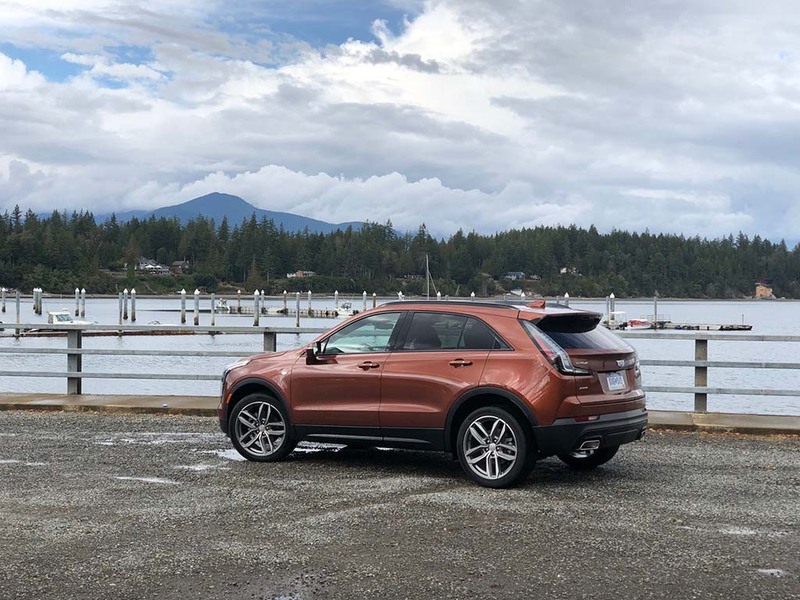 In Sport mode the difference is readily apparent, as we discovered during a lengthy drive through Seattle, Tacoma and the rugged Washington coast. While steering isn’t quite as tight as you might expect from some competitors’ Sport+ settings, it’s enough to give you a good feel of the road, especially through some of the rugged logging roads we set out to explore. We had to work hard to get the tires to complain and, with the aid of that torque vectoring system, the XT4 proved to be one of the more nimble offerings in its segment. For those who would like to boost mileage during more routine conditions, switch to Touring Mode and the driveline decouples the rear axle. 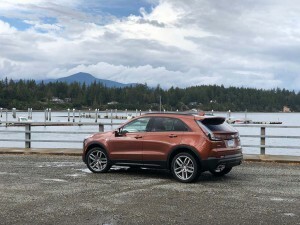 On the whole, the driving experience in the 2019 Cadillac XT4 is impressive. No, it’s not the fastest model in its class, at just over 7 seconds 0 to 60, but even on the rough pavement the Northwest region seems to favor, the crossover’s cabin is pleasantly quiet, with just a bit of engine grunt under flat-out acceleration. It’s only when you get up to near redline that it gets a bit whiny. 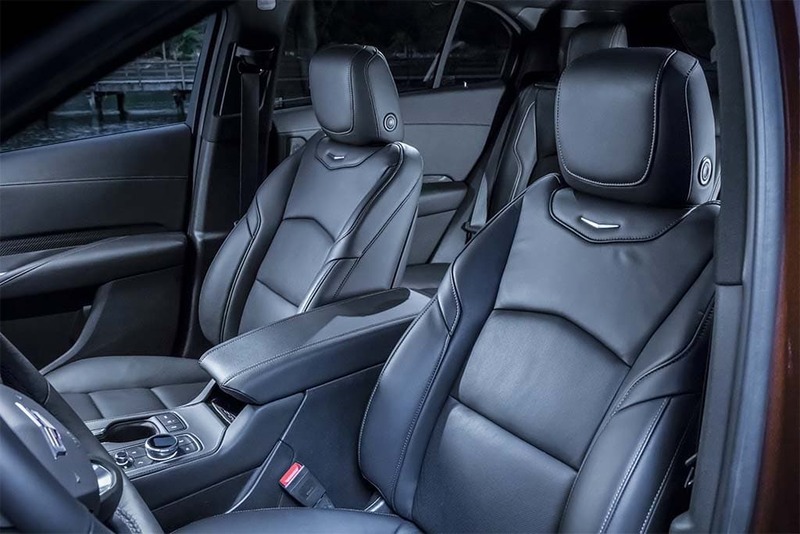 As for the cabin, the seats in both the Premium Luxury and Sport models are comfortable over extended distances, with a reasonable amount of bolstering that kept us in position even on those twisty logging roads. The new XT4 doesn't short buyers on luxury finishes or appointments. While not the most lavishly executed in terms of materials, the cabin is reasonably well-appointed and fit-and-finish comes in at world-class. 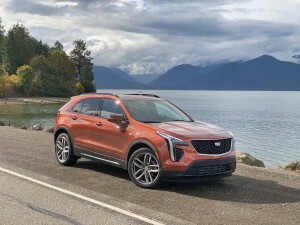 For the XT4, meanwhile, Cadillac has adopted the latest version of its Caddy Cue infotainment system and deserves kudos for listening to customers. The slider volume control – which always seemed out of sync with what level you wanted – has been replaced by a conventional knob. There’s also a large knob on the center console, just behind the e-shifter, that operates a variety of different functions. If your touchscreen is set to radio, for example, it tunes stations. With a map displayed it zooms in and out. It’s a well thought-out strategy. Most other operations are still handled by the touchscreen – or by voice or by controls on the steering wheel. The XT4 gets Apple CarPlay and Android Auto, as you’d expect. There’s wireless charging and an LTE WiFi hotspot. It is also one of the first cars that integrates near-field communications, or NFC, to pair your phone. It’s a lot simpler than the standard Bluetooth process Unfortunately for iPhone owners, Apple hasn’t integrated the technology yet. 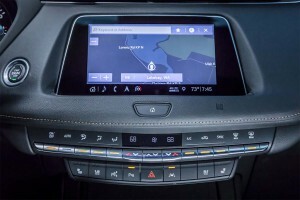 The new infotainment system on the XT4 may help Cadillac's image problem in this area. 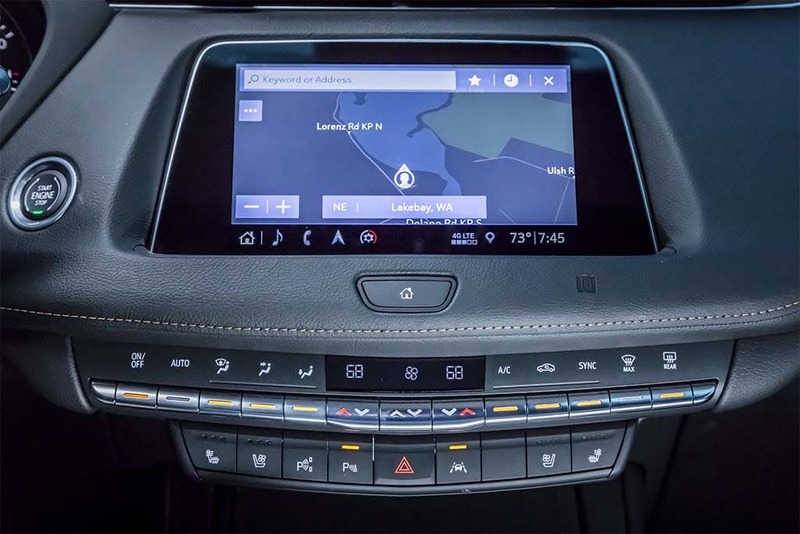 There’s tons of tech onboard, too, with Cadillac’s latest Cue infotainment system, housed in a high-definition, 8-inch touchscreen. The screen is very responsive with lots of shortcut buttons, and it can be controlled by a rotary dial in the center console. In fact, I like using the dial better, as it feels less distracting while driving. The technology, as you’d expect, extends to safety and Advanced Driver Assistance Systems, including Lane Departure Warning, Forward Collision Warning with automatic emergency braking and the now-required backup camera. The downside is that some of those features aren’t offered on the bottom of the Y, the Luxury edition. Indeed, Cadillac appears to have studied the German approach to marketing in detail. You’ll find yourself not just moving up the ladder but adding quite a few options to get a fully loaded XT4 – which can push you into the mid- to high-$50,000 range. Then again, if you want a basic compact crossover that has a fair amount of luxury features, lots of space, good room and solid handling, the “base” model is a pretty good deal. Caddy is planning to continue expanding its crossover line-up over the next few years in a bid to play on the same level as its key competition. The good news is that if it does as good a job going forward as it did with the XT4 we’ll have plenty of good things to talk about. This entry was posted on Monday, September 17th, 2018 at and is filed under Asia Pacific, Automakers, Automobiles, Business, Cadillac, China, Crossovers/CUVs, Executives, First Drive, Luxury Vehicles, Markets, Personalities, Reviews, Sales, Sales, Trends, U.S./North America. You can follow any responses to this entry through the RSS 2.0 feed. Both comments and pings are currently closed.